Christians: Not of the World? It’s a well known phrase that has been preached in many sermons and repeated by many, many more Christians. It is a conviction which many Christians, especially of the Bible-believing, conservative-evangelicalish type, understand the relationship they are to have with the world. That’s why you won’t hear such Christians talk about going out to see the movie Fifty Shades of Grey followed up by dinner at some restaurant like Hooters or Tilted Kilt. “I am not asking you to take them out of the world, but I ask you to protect them from the evil one. They do not belong to the world, just as I do not belong to the world. Sanctify them in the truth; your word is truth. As you have sent me into the world, so I have sent them into the world. And for their sakes I sanctify myself, so that they also may be sanctified in truth” (NRSV). The idea of sanctification means to be holy, set apart for God and his mission. While Christians are sent into the world, rather than withdrawn from the world, Christians must abstain from living as the world because they do not belong to the world. The Apostle Paul expresses a very similar concern as he commands the Christians in Rome saying, “Do not be conformed to this present world… (Rom 12:2). But living as people who are not of the world is more than just abstaining from certain segments of the entertainment culture. In his book Exclusion and Embrace, Miroslav Volf writes about the strangeness that Christians are to have regarding their culture as a result of their allegiance to God rather than country. Such strangeness gives “…a vantage point form which to perceive and judge the self and the other not simply on their own terms but in the light of God’s new world…” (p. 53). Thus, by embracing this strangeness, Christians are able to see the world as God sees it and respond in ways that reflect the new creation they belong to. The importance of this strangeness cannot be overstated. Two Sunday’s ago I turned on the news and was horrified by the news that twenty-one Coptic Christians were beheaded as martyrs of Jesus Christ by the terrorist group ISIS. It is horrible and as expected, everyone believes something needs to be done about such terrorism. The world, including the United States, will meet such violence with violence. Militaries will wage war and the masses will champion the cause as if it will really save the world, ridding it of evil. Yet a lot of Christians, including some preachers, are among the masses cheering this cause and here in the United States it too often ends up having to do with what is best for America… filtered through whatever political camp one affiliates with. So much for being not of the world! I’m not writing this just for the sake of being critical. I’m concerned with how the church is going convince this broken world of the gospel when so many Christians speak as people who still belong to the world? 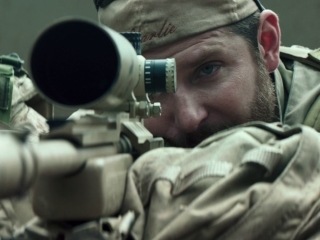 I went and saw the movie American Sniper yesterday. It was a realistically brutal portrayal of war, in more ways than one. Besides the bloodshed and the loss of lives of both Americans and Iraqi insurgents, who both bear the image of God, families suffered on both sides for the gods of war. As the movie finished, I was left with nothing but sadness. There was anything to celebrate, there wasn’t any winners to applaud, and there wasn’t any heroes to venerate as a legend. What I saw were victims. That’s right, victims! I saw victims of a dark and broken world where everyone keeps trying to kill everyone not in a war that ends all wars but as a war that only begets more war. The only way the world is ever going to know there is hope beyond such mayhem, the future hope which Jesus has established through his own crucifixion and resurrection, is for Christians to speak of such hope… to speak as people who are not of this world in response to the terrorism and violence of this world. The world doesn’t need the church to champion its way of the sword, as it already has plenty of people ready and willing to do that. What the world needs is for Christians “to be concerned about nothing among [the world] except Jesus the Messiah and him crucified” (1 Cor 2:2) because it is only through the crucified Jesus that the world will ever know the hope of the resurrected Jesus. This entry was posted in Contemporary Christianity, Contemporary Culture, Discipleship, Hope, Scripture, Theology. Bookmark the permalink. Amen. I read that when,asked what she,would,do if she saw an ISIS killer of her son, an Egyptian Coptic mother said, ´I would invite him home to eat’. Jesus always linked our knowledge of God with the overcoming love of our enemies…. this Coptic mother whom many Christians in this country would hardly consider Christian at all, has put us all to shame.